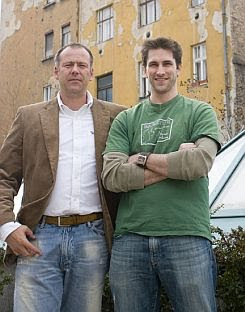 This is part 2 of my interview with Jared Salter, CEO of time based travel discovery and inspiration company Joobili (pictured here to the right of Joobili Co-founder Tamas Gabor). In Part 1 we discussed the founding of the company including raising money in Budapest with just a powerpoint presentation. In this part Jared and I talk functionality, discovery and inspiration online and turnips. BOOT: Your site starts of with a time based search rather than destination based search. You need a lot of data to provide consumers with information on every event and activity around the world. Where do you get the data from and how do you plan to get more? Jared from Joobili: We started off by creating it in house with a team of writers scouring the web, collecting events and writing up. We needed to do this to get us started, however clearly there is a scalability issue with approach. Now we are partnering with local tourism offices to access their content. In this area there is a big advantage is being in Europe. We now have deals with 12 or13 European national tourist offices, 25 regional tourism boards and 75 plus local promoters. They have joined us Joobili pro members. We give them a back end to upload and manage events. BOOT: Where are you in the evolution of the product? Jared from Joobili: Very early. We only became visible to Google in the last month as we were so focused on the front end. I am not worried about this as I feel this is pretty common with start ups. BOOT: A challenge with a discovery and inspiration site is to decide how to balance up front searching and refinement. How much to you request from the consumer before a search is conducted versus how much to you move the consumer information collection to the post search refinement stage. I could not help but notice that in a random search I have just conducted for Nov 11-18, the number one recommended event is the Raben-Chilibi Turnip Festival in Richterswil Switzerland. Clearly I will need to refine this search for there to be valuable information (not that I have anything against the Swiss or Turnips). How did you balance asking for information upfront versus refinement? Jared from Joobili: It was a big internal debate and am not sure we have found the answer yet. We made the decision to err on the side of simplicity by having only a date search at the beginning. You might seem more filters on the front page in later versions but for launch we erred on simplicity with just time search up-front. We will need a much need larger content base before pushing the filter angle and profiling. Paraphrasing TripAdvisor’s Marc Charron– when it comes to profiling “rather than figuring out who you are, it is about figuring out when you are”. Completely agree with your EveryYou idea. We are saying to the customer – “tell us when you are and then filter who you are”. BOOT: Another challenge for a discovery and inspiration site is building customer loyalty. Getting the customer to use the product more than once. How have you through about the challenge of customer retention? Jared from Joobili: According to Google, the online travel research process is 29 days from inspiration to book. Therefore we are planning to introduce a save search parameter. We know you want to go on holiday on a certain date – so we will let you save that search. We can then provide email notification any time a new event is added to the database. Or eventually build a recommendation engine based on that search parameter. The next part will be integrating price into the results through partnerships with other sites. One other trend is that price is no longer the sole motivator as discounting becomes permanent. For example we have been working with Wizz air [Low cost carrier in Europe]. They offer a 50 euro flight to Rome. It is always 50 Euro. There is not longer an urgency around the discount or low price because they always a low price. Therefore Wizz need to match the cheap flight with time sensitive inspiration to build in a sense of urgency. Price is an extremely motivator for travel behaviour but it is becoming not enough to drive urgency in consumer behaviour. BOOT: What else in online travel has you excited? BOOT: How radical do you think the change will be in how we search and book travel online? Are the big four Online Travel Agents facing the same sort of radical change and industry shift that the offline agents faced in the 1990s and if they are not careful the OTAs could be in real danger? Jarend from Joobili This period of change is not exactly the same [as the 1990s early 2000s were for offline]. The big OTAs will not be the innovators in the industry but have such a controlling part of the pie. Joobili can innovate the discovery process but need the big guys to make the booking. We hope we generate more interest in the discovery stage. This will be more than just about content – as consumers have to know what you are searching for. All of these sites are throwing in content for SEO benefits but still asking consumer to type in what they want. Is not about the content it is the interface or experience to help the consumer to discover something new. I enjoyed this chat with Jared. Not least of which because it was good to get a European perspective on the travel discovery market. Joobili is still in seed stage so we need to be a little bit forgiving on the “turnip” result but it highlights that there is a lot of data collection and back end refinement/recommendation work that Joobili needs to do before the product is ready for any dramatic marketing investment. I think Jared knows this. For more on the challenges in starting a content company see my 3 rules for starting a UGC business. Part 1 of the interview is here. Tim, thanks for the interview. Just wanted to clarify the quote about the importance of knowing WHEN your users are, i.e. current intentions don't always match past actions, was paraphrasing Marc Charron from TripAdvisor, not Steve Hafner (Kayak). As you said, Joobili and the entire online travel discovery category still has a long way to go, but it is an emerging space worth keeping an eye on. @Tim, I definitely think the big OTAs are in for a major industry restructuring. They are locked in in ad/price war with each other, and have stopped innovating. There's a Forrester survey that states 54% of online travel shoppers are unsatisfied with major OTA offerings. Don't know if that's accurate but seems believable. @Jared - good luck. I think your UI work will pay off. Joobili is one of the most engaging travel discovery sites out there today. Interesting business model and good luck to these guys. Personally, I struggle to see how this will become main stream. I think, it may capture a small portion of the market but the underlying business model I don’t believe will hold main stream appeal as a stand alone travel search alternative. I think this model, fully integrated into the search process of an established OTA would be more interesting. In this context, I see Joobili as the powerchip to the motor vehicle – The OTA acts as the Motor Vehicle and provides the core grunt and the addition of Joobili will add some more horse power. I think innovation is slower in the OTA space but the underlying business model will remain strong. As technology becomes more complex new online business models will emerge. Will it get to a point where consumers simply switch off and remain true to what works? Personally, I think the biggest idea for those wanting to make it big in the online travel space is closer to us than we think.